FRESH AIR IN A BUCKET | Pro Chem, Inc.
FRESH AIR IN A BUCKET adds a new dimension to air freshening. 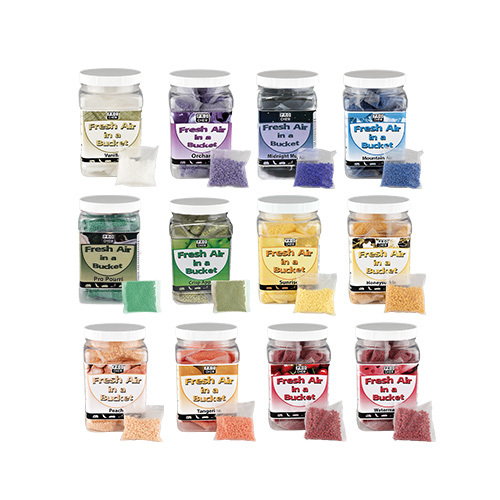 Using the latest technology, fragranced beads are tucked neatly into a unique airflow bag, providing focused fragrance that is easy to use and cleanup. Can be used in vacuum cleaner bags, pet care areas, garbage areas, air vents and filters, automobiles and restrooms. The possibilities are endless. Bead bags are recyclable when put in with plastic recyclables. Packed in 24 one-ounce bags per bucket.